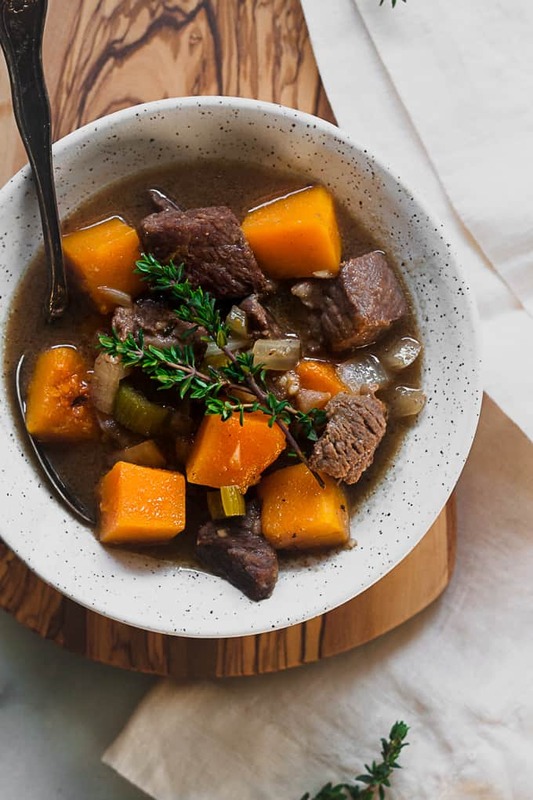 This Whole30 Butternut Squash Beef Stew is made in the slow cooker and is the perfect comfort food on chilly winter nights! A big thank you to Bare Bones Broth for sending product for me to create this recipe. As always, all thoughts and opinions are my own! Yes! You read that right. COMFORT FOOD on Whole30. It’s possible and honestly so darn good. There is nothing I love more than coming home on a cold winter night to an already cooked dinner thanks to the magic of a slow cooker. This butternut squash beef stew isn’t your traditional ‘dump everything in the slow cooker and press start’ recipe. I mean it totally can be if you want… but I recommend you taking a few extra minutes for one crucial step. This does take a few extra minutes but it is totally worth it. Searing the meat first allows you to lock in all of the juices and keep the beef extra tender as it cooks all day in the slow cooker. Plus, you can then deglaze the pan and get all those extra good flavors back into the stew. It’s a win-win. 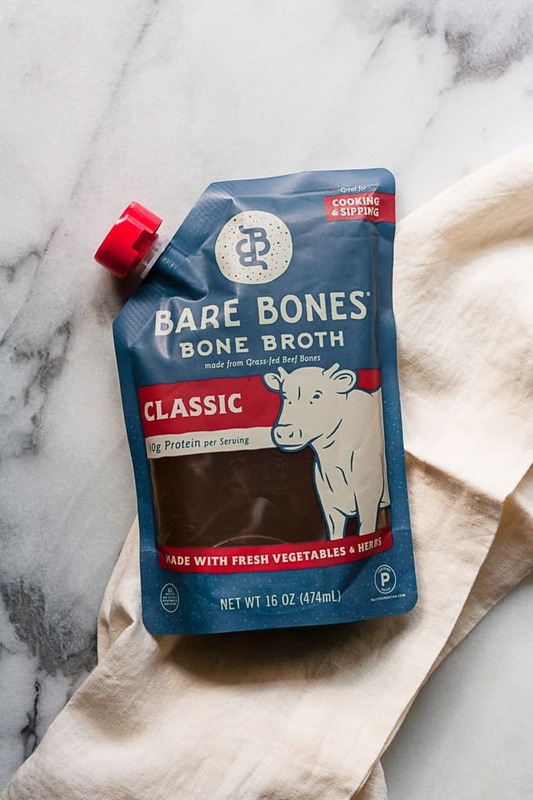 The other step that is a game-changer in terms of flavor is using beef bone broth. If you have never used bone broth before, it is similar to stock but with more intense flavors and some serious gut healing properties. As someone who struggles with several autoimmune issues, I am always looking for foods that support gut health and good gut bacterial (because EVERYTHING starts in the gut). And I have found that bone broth is one of the simplest ways to give my gut a little extra loving! 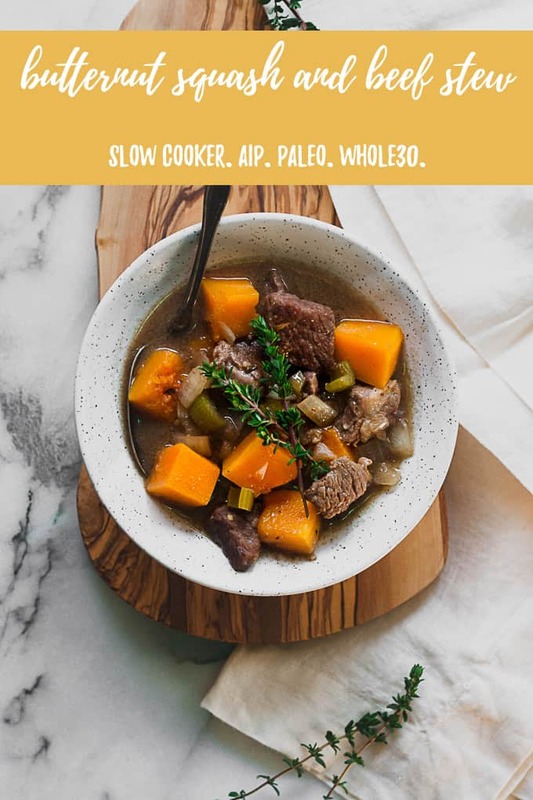 For this recipe, I used Bare Bones 100% Grass-Fed Beef Bone Broth and could not recommend it enough! They also have turkey, chicken, and a rosemary-lemon chicken that I cannot wait to use in chicken zoodle soup. 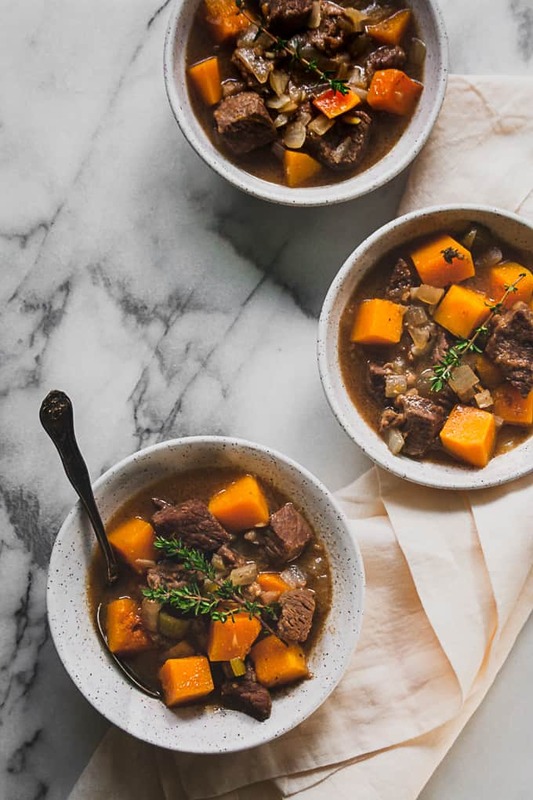 I hope this Whole30 butternut squash beef stew makes its way onto your table this week, even if you’re not doing Whole30. If you make this recipe, remember to tag @imhungrybynature on Instagram! 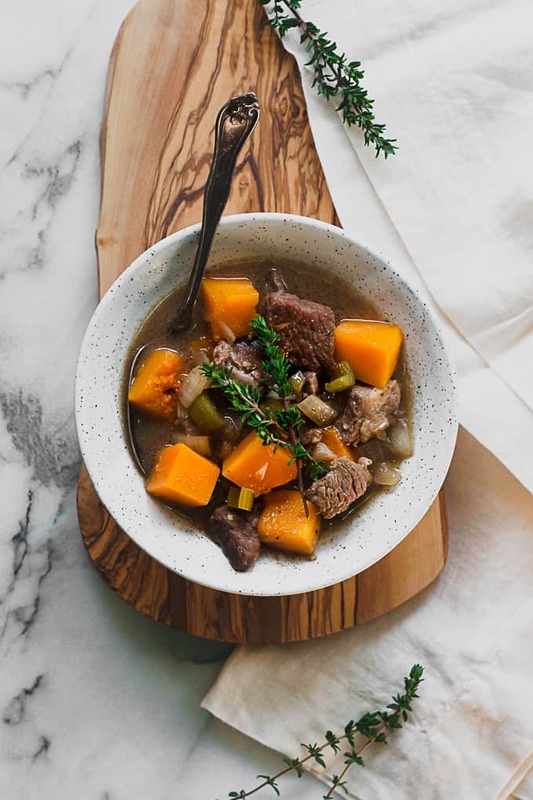 This Whole30 Butternut Squash and Beef Stew is made in the slow cooker and is the perfect comfort food on chilly winter nights! Cube beef into 1 inch cubes and place in a large bowl. Sprinkle beef with 2 tablespoons tapioca flour, salt, and garlic salt; toss the cubes in the flour mixture to coat. In a large dutch oven over medium high heat, warm 1 tablespoon of the oil and add half of the floured beef cubes, then brown the beef on all sides. Transfer the beef to the slow cooker. Add another tablespoon of oil to dutch oven and brown the rest of the meat on all sides. Add the garlic to the dutch oven and cook for 30 seconds to 1 minute or until garlic becomes fragrant. Add to the slow cooker. Add the remaining tablespoon of oil to the pot and cook the onion and celery for 4-5 minutes or until softened, then add to the slow cooker with the beef. Add 1 cup of broth to the Dutch oven and bring to a boil, scraping the bits from the bottom of the pot. Whisk the 2 remaining tablespoons of flour into 2 tablespoons of the beef broth, then mix into the rest of the liquid and add to the slow cooker with the vegetables, bay leaves, and thyme. Cook on high for 3 hours or low for 6 hours. Remove the bay leaves and serve.